When a homeless man receives a supposedly winning ticket, you’d expect him to go running off with the money. But not this particular homeless man. Actually it was all a prank, done with good intentions by a man named Rahat. Rahat had noticed the homeless man who had been described by those who knew him as a good man. So he gave the man a supposedly winning lottery ticket, and asked him to claim the ‘prize’ at the store. 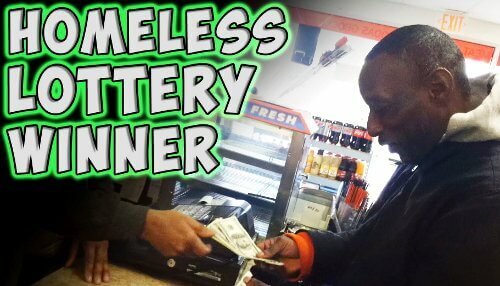 When the homeless lottery winner was handed a $1000 dollar prize, he tried to share it with his benefactor Rahat. The man was even teary eyed as he thanked the prankster who immediately posted the video of the incident on YouTube. Everybody leaves happy. The man had his $1,000 and Rahat had another viral video in the making. UPDATE: The story continues – people wanted to donate more so Rahat set up a page. See the latest on the story here.